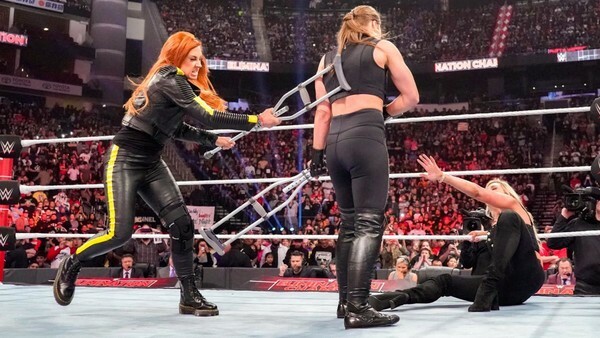 Not exactly peering into the unknown this, but the built continued in earnest for what has the potential to be the best triple threat in company history thanks to the powerful crutch-assisted sh*tkicking Becky Lynch dished out to current Raw Women's Champion Ronda Rousey and Current Number One Contender Charlotte Flair. 'The Queen' may have been given the gift of the position by Vince McMahon, but her proverial crown was sent flying into Row Z by 'The Man' at Elimination Chamber. Rousey's own fearsome aura went with it as Lynch raged against the machine and the two women she feels are benefiting most from it. It remains to be seen if Becky will have another hurdle to leap over en route to the headline spot on the night or if she'll be an announced competitor in the final stretch, but WWE must have been thrilled with the outrage they generated ejecting her in the first place - her eventual reinsertion will be twice as sweet.